In today's photo of the day, we see protestors outside the Nigerian Embassy rallying for the return of hundreds of school age girls abducted from their secondary school in northeast Nigeria three weeks ago. Photo by CNN's Burke Buckhorn (@bbuckhorncnn), May 6. More girls have been kidnapped in Nigeria, village residents told CNN, saying that armed men in vehicles abducted eight from Warabe village, which is in the northeast of the country. Residents said the gunmen moved from door to door late Sunday and took the girls, who are between 12 and 15 years old. 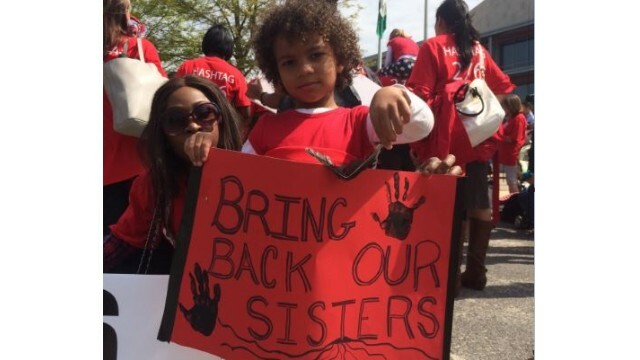 If you support #BringBackOurGirls, share your photos with us at #NewDayCNN.